← Brazil’s Population Growth Rate Fell Faster than India’s: Why? I’ve just started to update my book on doing business in India, and I came across this statement: In 2008, The World Bank ranked India as 120th out of 178 countries in the difficulty of doing business. At that, its rank had improved from 2007, where it ranked #132. This is the World Bank’s annual ranking, based on a survey about the complexity of regulation. So, I wondered, how has that changed? Had its rank improved further? Singapore and Hong Kong come in at #1 and #2. New Zealand’s 3rd, the UK 4th and the US is 5th. India’s 2009 and 2011 ranks aren’t strictly comparable. The World Bank now evaluates 183 countries, not 178. Also, an indicator on which India performed better than average in 2008 — Employing Workers — has been suspended in the 2011 rankings (it’s being reviewed for methodology). But still — these rankings are no way an improvement. WHAT ARE THESE RANKINGS, ANYWAY? 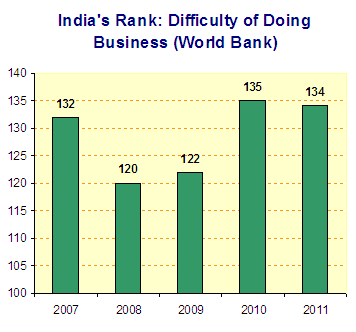 The ease of doing business index is limited in scope. It does not account for an economy’s proximity to large markets, the quality of its infrastructure services (other than services related to trading across borders), the strength of its financial system, the security of property from theft and looting, its macroeconomic conditions or the strength of underlying institutions. There remains a large unfinished agenda for research into what regulation constitutes binding constraints, what package of reforms is most effective and how these issues are shaped by the context in an economy. The Doing Business indicators provide a new empirical data set that may improve understanding of these issues. WHO DOES IT TALK TO? Surveys are administered through more than 8,200 local experts, including lawyers, business consultants, accountants, freight forwarders, government officials and other professionals routinely administering or advising on legal and regulatory requirements. So they’re averaging 40-50 people surveyed per country, though I’m sure the actual number in each place varies quite a lot. India’s still an attractive place for companies. But as with people — attractive shouldn’t be confused with easy. This entry was posted in Doing Business in India and tagged Doing Business in India, India Business Checklists, Indian government. Bookmark the permalink.